Nathaniel Banks was known as “Old Jack’s Commissary General” and “Commissary Banks.” A Union General, Banks was defeated by Stonewall Jackson at Winchester on May 25, 1862 and Cedar Mountain on August 9, 1862. He was typical of a breed of political generals who commanded volunteers with unfortunate military results. 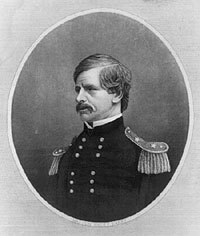 He later commanded the Department of the Gulf, succeeding General Benjamin Butler [in New Orleans] but he had similar difficulties in achieving a coordinated policy of Reconstruction in Louisiana. 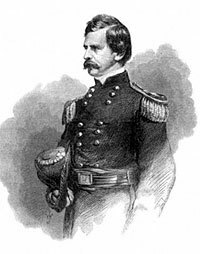 He besieged Port Hudson and accepted its surrender after Vicksburg had also fallen in July 1863. After he was defeated in the Red River campaign in the spring of 1864, General Ulysses S. Grant urged his removal, but Banks had important political support. 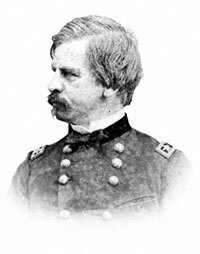 “I regard General Banks as one of the best men in the army. 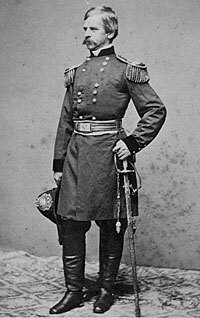 He makes me no trouble; but, with a large force or a small force, he always knows his duty and does it,” President Lincoln said in August 1862.1 General Henry Halleck wrote Grant: “Genl Banks is a personal friend of the President, and has strong political supporters in an out of Congress. There will undoubtedly be a very strong opposition to his being removed or superceded, and I think the President will hesitate to act, unless he has a definite request from you to do so, as a military necessity, you designating his successor or superior in command…The President will require some evidence in a positive form to show the military necessity of the act.”2 It Wasn’t until May 19, 1864 that Banks was relieved. Banks subsequently spent a great deal of time in Washington, D.C. reviewing Louisiana policy with President Lincoln. He did not return to an army command. Something of a political opportunist, he had been the temporary presidential candidate of the northern Know-Nothings in 1856, but refused the nomination. Banks had served one term as the even-handed speaker of House of Representatives (1856-1857); he returned to the House for six terms after the Civil War and also served a U.S. marshal in Massachusetts. He ran mostly as a Republican, but ran once unsuccessfully as a Democrat-Liberal Republican and once successfully as an independent. 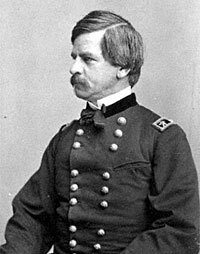 He had briefly succeeded George B. McClellan as president of the Illinois Central Railroad in 1860-1861 — effectively derailing any attempt to place him in the Lincoln Cabinet as a “New England” representative. Don E. Fehrenbacher and Virginia Fehrenbacher, editors, Recollected Words of Abraham Lincoln, p. 167. Brooks D. Simpson, Ulysses S. Grant: Triumph Over Adversity, 1822-1865, p. 276. H. Draper Hunt, Hannibal Hamlin, p. 133. Allan Nevins, The War for the Union: War Becomes Revolution, 1862-1863, Volume II, p. 402.